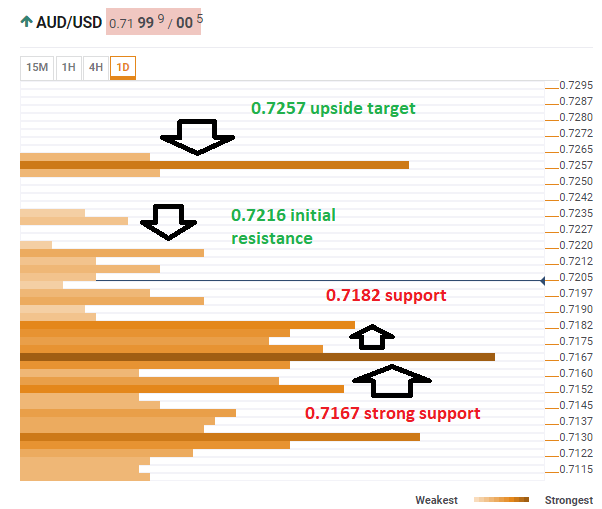 You are at:Home»Category: "Daily Look"
AUD/USD advanced following the upbeat Chinese GDP data. Australia’s exports to China enjoy the fresh stimulus. How far can it go? The Technical Confluences Indicator shows that AUD/USD faces weak resistance at 0.7216which is the convergence of the Bollinger Band 15min-Upper, the Pivot Point one-week Resistance 1, and the PP 1d-R2. Further above, more significant resistance awaits at 0.7257 which is the confluence of two pivot points: the one-month R2, and the one-week R2. Looking down, some support awaits at 0.7182where the Simple Moving Average, the previous day’s high, and the BB 1d-Upper all converge. The most significant support cluster is at 0.7167where we see the Fibonacci 38.2% one-day, the BB 1h-Middle, the Fibonacci 23.6% one-week, the SMA 200-15m, the SMA 50-1h, and the Fibonacci 23.6% one-week. A daily forex forecast for the upcoming events of the day that will impact forex trading ► These forex outlooks are published daily. USD/JPY faces tough resistance, break or bounce? Is the only way up for EUR/USD?